Robina Group has officially launched Bohème Apartments as part of its $200 million CityVillage Masterplan. The $30 million boutique development released today, features 52 apartments over seven levels. Bohème Apartments will add a vertical element to CityVillage, with previous releases of terrace homes in the area selling out within 48 hours. 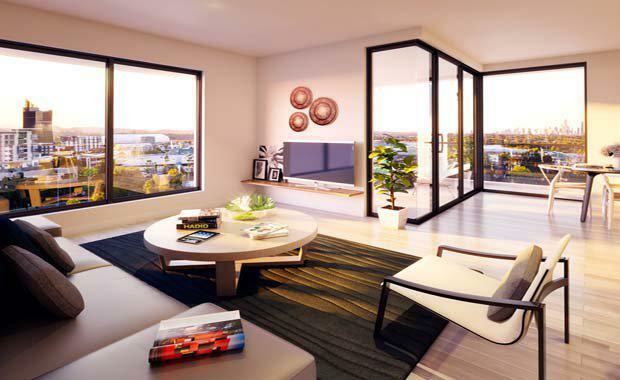 CityVillage has become one of Gold Coast City’s most highly sought after addresses. Located in a waterside position, residents will have pedestrian access around the central lake to Robina Town Centre. The exterior of the apartment building will feature contrasting elements, with timber and monochrome palettes, to harmonise with the CityVillage community. Bohème Apartment residents will also have access to an exclusive oasis, The Common. The Common consists of a saltwater pool, lush tropical gardens, turfed sections, with plenty of entertainment areas for relaxation. Tony Tippet, Robina Group Director, said the apartments were carefully designed to create a smart, airy and modern living space, with entertainment sized balconies. "The kitchens will feature ILVE stainless steel Italian appliances and pendant lighting over stone island benches," he said. Bohème will be the first apartments released in CityVillage, the community developed on a four hectare site, adjoining The Crestway and Christine Avenue. "The demand for properties in CityVillage has been huge," Mr Tippett said. Mr Tippett said the central Robina location drew buyers to the building, with its rich environment in the heart of Gold Coast. "Bohème offers residents a walkable lifestyle, with Robina Town Centre’s shopping, dining and entertainment precinct, just 350 metres away,” he said. "Robina train station and transport hub, Bond University, Robina Hospital and medical precinct, Robina Automall, Cbus Super Stadium, an array of public and private schools and golf courses are also all nearby. Bohème will include 45 two bedroom apartments, ranging from 87 square metres to 129 square metres, and seven three bedroom apartments, from 114 square metres to 153 square metres. Apartments start from $459,000 for a two bedroom and $499,000 for a three bedroom.